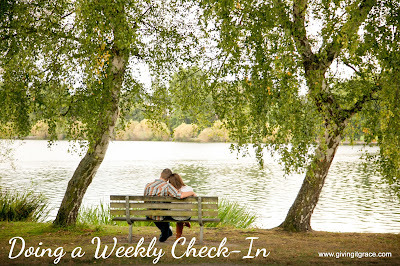 My husband and I started doing a weekly check-in each Sunday shortly after we got married. I'm all about intentionality and this seemed like a great way to ensure he and I were having purposeful conversations on the regular. After a while of doing the weekly check-ins they became less like an interview and more just a framework for a conversation we have about how our week went and what our upcoming week looks like. Doing a weekly check-in with your spouse is a great way to get past the "How was your day? Good" conversation. We've also found a weekly check-in is especially helpful if you have tiny humans in your house dominating the topic your conversations. Having this chat every Sunday encourages my husband and I to push pause and just spend some time face to face before we start a new week. What is your high and low from past week? I really try to listen to his answer on this question, as often things going on at his job are either his high or his low. I find it worth noting if he's stressed at work so that I can be mindful of that when he's at home. I love this question. I am easily susceptible to putting standards on myself as a wife that mean nothing to my husband. I've learned over the years that my husband does not feel loved by a fancy Pinterest dinner or the fact that I make the bed every morning (which apparently I just do for me as he could care less). He almost always answers this question by saying he feels loved by how well I take care of our kids. As taking care of the kids often takes up my entire day, it's such a relief to know that really the only thing I can offer him right is the very thing that makes him feel loved during this season in our lives. Anything I need to be called to repent of? I also love this question, as it prevents me from being a nit-picky wife (most of the time!). If Kyle does something during the week that rubs me the wrong way I make note of it to talk about at the weekly check-in. If it's still bothering me on Sunday night, I tell him about it. If I forget come Sunday, clearly it wasn't worth mentioning in the first place. Obviously if it's something huge we address it in the moment, but most of the time it can wait. I also like this question because Kyle knows it's coming and his heart is in a good place to receive whatever I have to say. And vice versa; when Kyle has things he wants to bring to my attention I'm expecting it and am willing to listen to him more so during this time than I would be in the heat of the moment. How would you best feel pursued this week? Some might find this question weird because it's aimed at the bedroom (wink, wink! ), but in this season of our lives (having little kids) we find it's imperative to talk openly and often about the most sacred part of our marriage. Walking through the upcoming week on the calendar together helps prevent scheduling oopsies. It also helps set expectations so we both know what's going on and there's no "you never told me about that" or "I didn't realize you'd be home so late", etc. How can I support you logistically this week? This question is probably unnecessary to most but we find it's useful to be extra clear about what would be helpful to each of us so that we aren't making assumptions. Another question I really try to listen to his answer on - and then actually pray for what he asks for. As his friend, I really like to know what's weighing on his heart or what he is rejoicing over and coming alongside him for either.